Quick Sort is another sorting algorithm that is based on divide and conquer approach. Unlike merge sort that divides input elements according to their position in array, quick sort divides input element according to their values. Here is a three-step divide and conquer process for sorting a typical sub-array. Divide : Partition or rearrange the array a[p . . r] into two sub-arrays a[ p . . q-1 ] and a[q+1 . . r] such that a[ p . . q-1 ] <= a[q] <= a[q+1 . . r] . Compute the index q as part of this partition procedure. Here a[q] is called the pivot element. 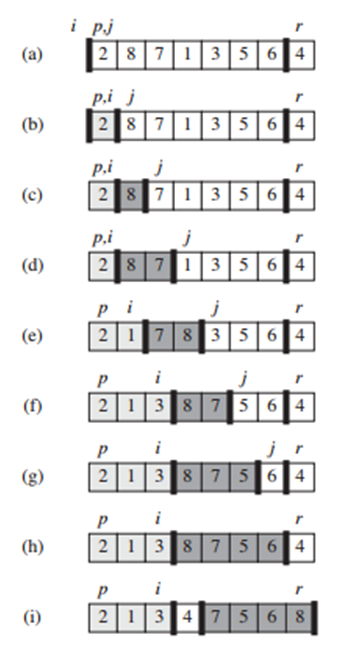 Conquer : Sort the two sub-arrays a[ p . . q-1 ] and a[q+1 . . r] by recursive calls to quick sort. Combine : Because the sub-arrays are already sorted, no work is needed to combine them : the entire array a[ p . . r ] is now sorted. Rearrange elements such that elements before pivot element are less than it and element after pivot element are greater than it. This arrangement of elements in accordance with the pivot element is called partition operation. 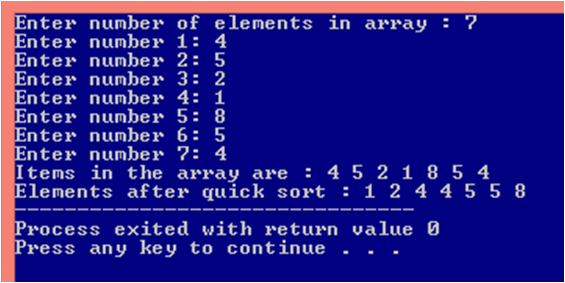 The above image shows the partition of Array elements ( Initial list ). Similarly the two sub-array before and after pivot element are partitioned. The complete steps of quick sort is shown below.